i need some help in identify these two pieces of equipment and i was told the briar press community were the people to talk to. so, what are these and is there a market for gently used items such as these? I will list them in the classified ads later if warranted. The top photo looks like a Ludlow stick (straight, non-centering, non-italic. The bottom one is a mold handle(?) for an Elrod material maker, though an Elrod user could give a better explanation. the first photo is a self quadding Ludlow stick. 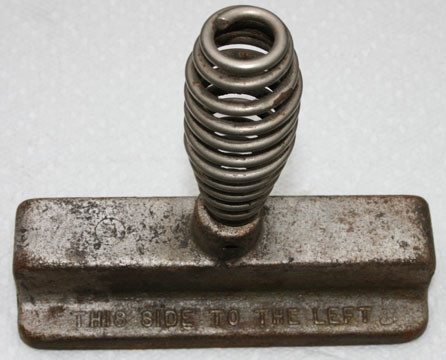 Generally used for setting ludlow mats flush left or flush right. cover to prevent hot metal from squirting up from metal pot on ludlow machine. Both are Ludlow tools with little value. Little value, maybe, if you don’t have a Ludlow, or already have these. I mean you won’t get rich selling them. Sorry not going to retire off of these items, but someone, somewhere may need them. Sell them if you have no use for them, or give them away for the cost of shipping. Anything but discarding them because they are of little value. thanks for the info, i think i will hang on to the ludlow self centering sticks. they are too interesting to just get rid off. i think i will post the two ludlow mouthpieces in the classified and see if anyone needs them for the cost of shipping. thanks again.